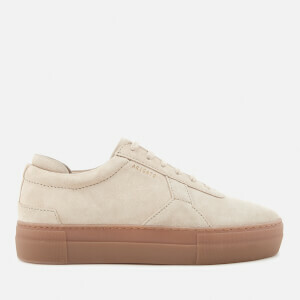 White ‘K-City’ low top trainers from French fashion brand KENZO. Presented with an outer layer of smooth leather and an inner sock-like construction, the women's sneakers feature a lace-up fastening, tonal stitching and a heel pull tab. Set upon a tonal chunky rubber sole, the shoes are finished with a white rubberised logo panel to the tongue.